Added another car to my collection. It's a 1997 FZJ80 Land Cruiser with full factory lockers. Planning to build this truck up to use on the trails. Last edited by lummieCB7; 08-07-2017 at 01:46 AM. I was expecting the LX to look ginormous next to the land cruiser, but it doesn't look that much bigger. Had BFG KO2's installed as well as an Old Man Emu lift kit. Added quite a few things since my last post. - Depo tinted rear LED tail lights. Installing new SCS F5 wheels this weekend. awwwwww man. What a beast of a truck. Put on a set of SCS F5 wheels this weekend. Last edited by lummieCB7; 08-07-2017 at 01:47 AM. Well, it needs the matching IPF lights for the ARB, but those are minor details. Yep, it's perfect. The jealousy is real. Fixed broken photobucket image links. Winch, shackles, roof basket and light bar. What else? I lived with my fiancee's parents while we looked for a house a couple of months ago. 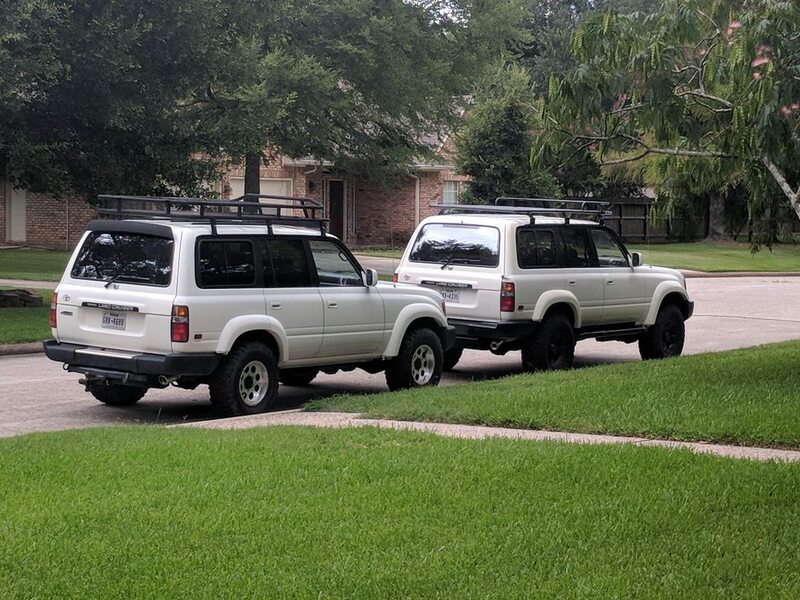 The neighbors next door had two of these, and a friend with an LX450 that was over every weekend. The people who own these seem to be pretty crazy about them. ARB front bumper, white Knuckle Off-Road rock sliders, OME 2.5" lift kit, SCS F5 wheels, BFG KO2 tires, factory e-lockers. It's in the shop right now getting the OME suspension replaced with Radflo bypass shocks and linger front springs to even out the rake. Last edited by Jarrett; 06-05-2018 at 02:12 PM. I was just pointing out the updates between this post and the previous one to cover things it looked like you had recently added. I should have been more clear, sorry. Man the 80’s are so nice. Do they make an updated fog / turn signal insert for the ARB? I like how the basket fits to the roof. You can purchase aftermarket LED signals for the ARB bumper. Here area few photos from last weekends trip to Hungry Valley SVRA. You're not having fun unless your truck leaves on a tow truck! (again) Both my truck and my friends Land Cruiser had our alternators go out after bombing through a mud pit a few times. I also had a fender flare fall off while going through the mud. We disconnected my friends rear drive shaft and shared a tow truck home. It gets beat up and put back together better every time! I think my cruiser was never taken care of this well by it's previous 6 owners haha. I mentioned that my fiancee's parents had neighbors that had a couple of these a few posts back. Here are theirs. It's a his and hers pair. Their each drive a GLK as a daily, too. Not much variety between them, but they like what they like. Here's an update with my truck. Had the alternator replaced, front flare reattached and have most of the nasty corrosive mud removed from the underside of the truck. I also got a new Safari Snorkel installed as well as a quick detail job to make it shine again.